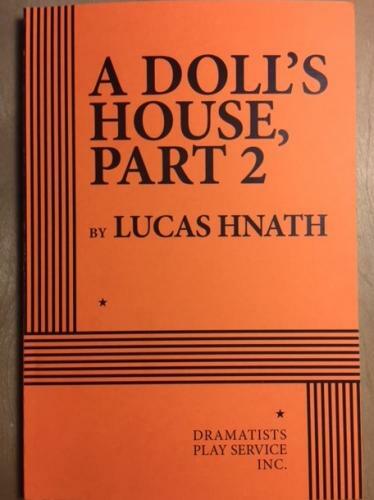 A Doll's House, Part 2 (Paperback) | The Drama Book Shop, Inc.
Lucas Hnath’s plays include THE CHRISTIANS (2014 Humana Festival), RED SPEEDO (Studio Theatre, DC), A PUBLIC READING OF AN UNPRODUCED SCREENPLAY ABOUT THE DEATH OF WALT DISNEY (Soho Rep), NIGHTNIGHT (2013 Humana Festival), ISAAC’S EYE (Ensemble Studio Theatre), DEATH TAX (2012 Humana Festival, Royal Court Theatre), and THE COURTSHIP OF ANNA NICOLE SMITH (Actors Theatre of Louisville). His plays are published by Dramatists Play Service. Lucas has been a resident playwright at New Dramatists since 2011, and is a proud member of the Ensemble Studio Theatre. Lucas is a winner of the 2012 Whitfield Cook Award for ISAAC’S EYE and received a 2013 Steinberg/ATCA New Play Award Citation for DEATH TAX. He has also received commissions from the EST/Sloan Project, Actors Theatre of Louisville, South Coast Repertory, Playwrights Horizons, New York University’s Graduate Acting Program, and the Royal Court Theatre. Lucas holds a BFA and an MFA from New York University's Department of Dramatic Writing. “[A] smart, funny and utterly engrossing play…Hnath approaches what might seem like a hubristic project with the humility and avidity of an engaged Everyreader. A DOLL'S HOUSE, PART 2 gives vibrant theatrical life to the conversations that many of us had after first reading or seeing its prototype…” —NY Times. “…lucid and absorbing…Modern in its language, mordant in its humor and suspenseful in its plotting…the play judiciously balances conflicting ideas about freedom, love and responsibility.” —Time Out NY. “Hnath’s inspired writing, which endows each character with an arsenal of fastballs, curveballs and spitballs, keep[s] us disarmingly off-balance. He’s an uncommonly gifted parodist. For all its seriousness, A DOLL'S HOUSE, PART 2 is suffused with a contagious bemusement.” —Deadline.com. “[A DOLL'S HOUSE, PART 2] delivers explosive laughs while also posing thoughtful questions about marriage, gender inequality and human rights…as much an ingenious elaboration and deconstruction of A Doll’s House as a sequel, and it stands perfectly well on its own…With unfussy eloquence, [the play] asks how much, in a century-plus, life has changed for Nora and women like her in a world that often still has firm ideas about where they belong.” —Hollywood Reporter.